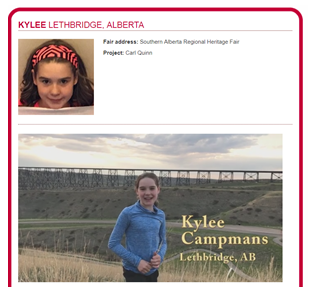 Of the 56,000 students who competed in Heritage Fair’s across Canada, Kylee Campmans was one of the two students who advanced to the national competition from the Southern Alberta Heritage Fair. The Galt Museum is proud to announce that Kylee received an honourable mention from the national selection committee.! Kylee’s project was very well researched and she passionately displayed her work. The judges at the Southern Alberta Heritage Fair were incredibly impressed and knew she would do wonderfully at the national level. It is great to see her hard work recognized in such a prestigious competition.